Here are some of the top things to look for in places that rent pontoon boats in Destin. The Emerald Coast covers a large area, but Destin is a concentrated part of the coast where a lot of the fun happens. When you begin the search for the hottest pontoon rental in the Destin area, look for rental spots that will keep you close to the fun. This means you'll still have the chance to explore on the water, but you won't have to travel far to access great scenery and excitement. A top spot to pick up a pontoon boat rental is from Destin Harbor. Not only are there many watersport rentals on the harbor to give you great choices in boats, but the harbor is just a 10-minute boat ride from the incredibly popular Crab Island. Fun is the objective whenever you're renting a pontoon boat in Destin, but that doesn't mean safety isn't also a priority. When inquiring about pontoon boat rentals, be sure to focus on safety features that can give you peace of mind when you're on the water. To start, the best pontoon boats will be equipped with all the necessary Coast Guard gear. That includes life vests for every passenger, each of which should be the correct size. Also ask about the age and condition of the boats. Boats with old motors are much more likely to break down, causing a safety problem, not to mention a bad day on the water. Lastly, make sure you get a thorough orientation on driving the pontoon safely and navigating the Choctawhatchee Bay. Great rental companies will make sure that all passengers, no matter how young, are safe and secure. Fun Activities Built Into the Price—and the Boat! One of the most enjoyable things about renting a pontoon boat in Destin is having the freedom to kick back on the water, enjoy the scenery, and make the most of the fantastic weather. However, a boat rental can also give you the opportunity to enjoy a range of great activities. When you break down the price per passenger, a day of fun on a pontoon boat rental is often cheaper than virtually any other vacation alternatives in a beach town. 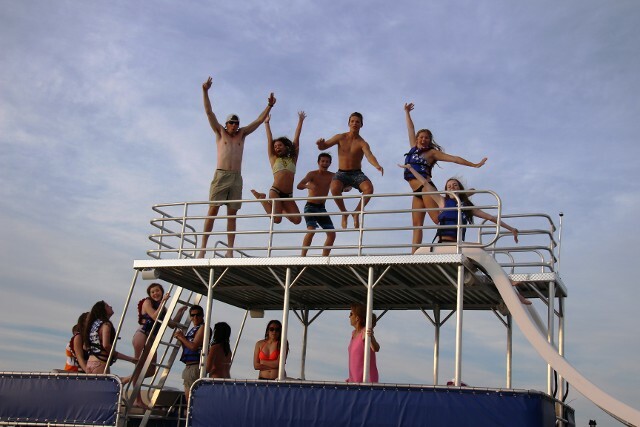 The most popular pontoon boats in Destin are double-decker pontoons with water slides. They provide endless fun for all ages, but there is no question that kids and teens will be particularly attracted to the fun these slides provide. With speakers on board, you can also bring along your choice of music to play via Bluetooth, creating a great atmosphere without spending an additional penny. The best rental businesses also won't charge extra for things like gas or docking fees. A great day on a boat means different things to different people. For some, it means a chance to spot dolphins and take photos. For others, it means a day of fishing, or perhaps some drinking in the sun at Crab Island. Look for pontoon rentals that let you set the tone. Bring your own coolers filled with food, snacks, and beverages. Bring fishing poles to try your luck at getting a catch of the day. Heck, for a small fee you can even bring your dog. Renting a double-decker pontoon boat with two water-powered slides goes a long way in helping you create the perfect vacation and memories that will last a lifetime. Double Fun Watersports in Destin, Florida, is your go-to spot for renting this type of pontoon boat. Great boats, great services, and an excellent location set the tone for an unforgettable day for you, your friends, and your family.